Pseudolymphoma is not a specific disease but rather an inflammatory response to known or unknown stimuli that results in a lymphomatous-appearing but benign accumulation of inflammatory cells. In cutaneous pseudolymphoma, resemblance to lymphoma is usually most apparent histologically, but some examples may also mimic lymphoma clinically. When known, the inciting agent should be included along with the diagnosis of cutaneous pseudolymphoma. The term pseudolymphoma without modification should be reserved for idiopathic cases. Localized, nodular pseudolymphomas are more common and typically mimic B-cell lymphoma clinically and are sometimes called lymphocytoma cutis. A variety of specific diseases, such as actinic reticuloid, lymphomatoid contact dermatitis, pigmented purpuric dermatosis, and lymphomatoid drug eruptions, are sometimes referred to as pseudolymphomas. These disorders often show broad patches and plaques and often mimic lymphoma, specifically cutaneous T-cell lymphoma (CTCL), histologically. [2, 3] Note the images below. This localized example of pseudolymphoma shows an ill-defined, thin, erythematous plaque. Pseudolymphomatous drug eruption due to captopril, marked by erythematous to purple papules, patches, and plaques. This erythrodermic pseudolymphoma (T-cell pattern) typifies drug-induced pseudolymphoma, which is most often secondary to anticonvulsant therapy. This example of lymphocytoma cutis shows a localized, erythematous-to-brown, ill-defined plaque. 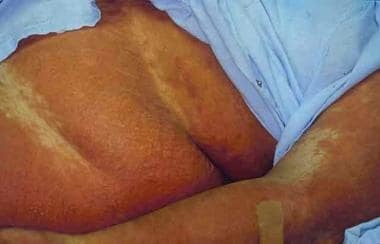 Lymphocytoma cutis of the shoulder, composed of flesh-colored or erythematous nodules in small groups. 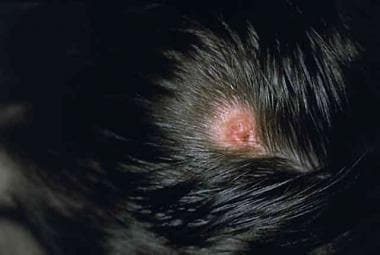 This photograph of lymphocytoma cutis caused by an arthropod bite shows an erythematous scaling patch of the scalp with localized secondary alopecia. Related Medscape Reference articles include Cutaneous B-Cell Lymphoma and Cutaneous T-Cell Lymphoma. The heterogenous clinical, histological, and etiologic nature of cutaneous pseudolymphoma along with the association of drug-induced hypersensitivity reactions has resulted in many different classification schemes and potentially confusing nomenclature. [4, 5, 6] Historically, the term drug-induced pseudolymphoma has been used to describe two kinds of adverse cutaneous drug reactions. The first is a subacute disease confined to the skin, wherein the clinical presentation and histopathologic findings may mimic either B- or T-cell lymphomas and which is the focus of this article. The second is an acute syndrome with a cutaneous eruption and associated systemic symptoms, also referred to as drug-induced hypersensitivity syndrome or drug reaction with eosinophilia and systemic symptoms (DRESS syndrome). In persons with pseudolymphoma, lymphocytes and other inflammatory cells are recruited to the skin in response to known or unknown stimuli. Most cases are idiopathic. Lymphocytoma cutis is not considered a lymphocytic response to malignancy. Cases of cutaneous pseudolymphoma with known etiology include reactions to tattoo dyes, jewelry (especially gold), insect bites, medications,  folliculitis, trauma, infections, vaccinations,  acupuncture, and contactants. A discrete subset of pseudolymphoma, borrelial lymphocytoma, primarily occurs in Europe in areas endemic for the tick Ixodes ricinus. Borrelial lymphocytoma is a response to infection by Borrelia burgdorferi subsp afzelius conferred by a tick bite. Another subset of pseudolymphoma is the result of an unusual systemic response to medications, typically anticonvulsants. Usually, drug-induced cutaneous pseudolymphoma is a T-cell proliferation, but occasional B-cell–predominant forms have been reported. In general, evidence of T- or B-cell clonality (by polymerase chain reaction analysis of T-cell receptor or immunoglobulin H gene rearrangement or immunohistochemical light chain analysis) supports true lymphoma, whereas polyclonality supports a pseudolymphomatous proliferation; however, both polyclonal lymphomas and monoclonal pseudolymphomatous infiltrates have been well documented in the literature. Alone, clonality is insufficient to predict clinical behavior. Some authors believe the reported cases of transformation may have actually represented diagnostically challenging indolent B-cell cutaneous lymphomas. [4, 11] Similar cases involving pseudolymphomatous T-cell infiltrates progressing to true T-cell cutaneous lymphoma may potentially occur, but these cases are less well-documented in the literature. Individuals with a slow acetylator phenotype may be more susceptible to developing atypical lymphoid infiltrates, owing to differences in drug metabolism kinetics, which may allow a pharmacologic antigen more opportunity to elicit an immune response or allow toxic drug metabolites to alter lymphocyte function. This proposed pathophysiology pertains primarily to drug-induced hypersensitivity syndrome. Thus, the details are not discussed extensively here; however, similar mechanisms of immunodysregulation have been suggested for drug-induced pseudolymphoma syndrome. The articles Cutaneous B-Cell Lymphoma and Cutaneous T-Cell Lymphoma may be of interest. 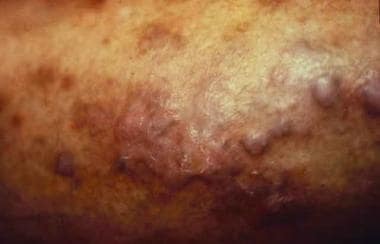 Drug-induced pseudolymphoma syndrome refers to a benign, drug-induced lymphocytic infiltrate in the skin that mimics cutaneous lymphoma histologically, clinically, or both. [4, 8, 10] While the clinical presentation can be highly variable, typically patients present with the insidious development of an asymptomatic singular lesion (papule, nodule, or plaque) following weeks to months of a drug exposure. 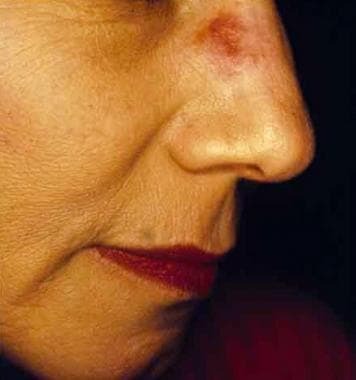 Less often, multiple lesions or widespread skin involvement (erythroderma) is seen. 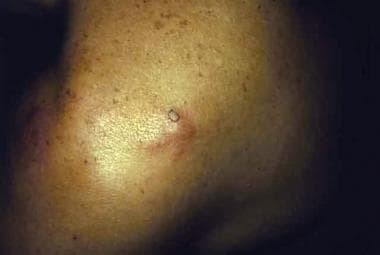 The skin lesions typically resolve within several months of withdrawal of the offending agent [4, 8, 10, 17] and may recur with reinitiation of the implicated drug. Since its initial report as a reaction to phenytoin more than 50 years ago, [11, 17, 18] more than a dozen additional drugs have been implicated. Clinicians should consider this diagnosis in patients with the appropriate clinical presentation and a history of drug therapy with one or more of the implicated agents. Anticonvulsants, typically phenytoin and carbamazepine, are the most frequent cause of drug-induced pseudolymphoma. Nevertheless, the number of implicated agents reported to cause either drug-induced pseudolymphoma or drug-induced hypersensitivity syndrome is expanding. No data on US prevalence or incidence of lymphocytoma cutis are available. Although drug-induced pseudolymphoma remains a rare disorder, more than 100 individual cases have been reported in the literature worldwide. No frequency data are available. A discrete subset of lymphocytoma cutis, borrelial lymphocytoma, occurs primarily in Europe, in areas in which the I ricinus tick is endemic. Although the majority of reported patients with pseudolymphoma are white, racial predilection has not been established. No racial predilection is apparent for drug-induced pseudolymphoma syndrome. Drug-induced hypersensitivity syndromes may affect black patients more frequently than white patients. [5, 6] The familial aggregation seen may be due to inherited defects in drug metabolism, making some patients more susceptible. In reported cases of localized pseudolymphoma, the female-to-male ratio is approximately 2:1. No significant epidemiologic data are available regarding entities in the T-cell pattern pseudolymphoma spectrum. Individuals of any age may be affected, but localized, nodular pseudolymphoma is most common in early life. The mean age of onset is 34 years. Two thirds of patients are younger than 40 years at the time of biopsy. Approximately 8% of cases involve patients younger than 18 years. Borrelial pseudolymphoma is more common in children than in adults. If the offending agent is removed, resolution of cutaneous pseudolymphoma is achieved. Idiopathic examples of cutaneous pseudolymphoma tend to be chronic and indolent. Spontaneous regression of cutaneous pseudolymphoma may occur over the course of months or a few years. Recurrence has been noted. Following cessation of the implicated medications, complete clearance of drug-induced pseudolymphoma syndrome is usually noted within 1-3 months. However, a few patients may require surgical excision or external radiation of one or more lesions. Recurrence following complete excision has not been reported. Occasional case reports of cutaneous pseudolymphoma have described evolution to lymphoma. A significant percentage of these cases may have represented histologically subtle lymphoma from the outset. Pseudolymphoma is not associated with mortality. Localized variants rarely result in morbidity other than minor pain or pruritus. In most cases, drug-induced pseudolymphoma regresses spontaneously following withdrawal of the offending agent. Misdiagnosis of these lesions as a malignant entity could lead to inappropriate chemotherapeutic treatment. Little is understood about the natural course of these lesions if drug exposure is allowed to continue. As discussed, transformation into malignant lymphoma has been reported in the literature, but many of these cases predate current diagnostic standards. Progression from a benign lymphocytic cutaneous infiltrate to cutaneous lymphoma remains poorly defined; however, close clinical follow up is prudent to monitor for such an event. If the inciting stimulus of the cutaneous pseudolymphoma is known, it should be subsequently avoided. Brodell RT, Santa Cruz DJ. 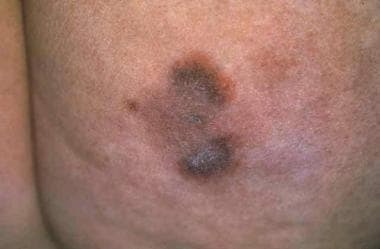 Cutaneous pseudolymphomas. Dermatol Clin. 1985 Oct. 3(4):719-34. [Medline]. Choi TS, Doh KS, Kim SH, Jang MS, Suh KS, Kim ST. Clinicopathological and genotypic aspects of anticonvulsant-induced pseudolymphoma syndrome. Br J Dermatol. 2003 Apr. 148(4):730-6. [Medline]. Bergman R. Pseudolymphoma and cutaneous lymphoma: facts and controversies. Clin Dermatol. 2010 Sep-Oct. 28(5):568-74. [Medline]. Albrecht J, Fine LA, Piette W. Drug-associated lymphoma and pseudolymphoma: recognition and management. Dermatol Clin. 2007 Apr. 25(2):233-44, vii. [Medline]. Bocquet H, Bagot M, Roujeau JC. Drug-induced pseudolymphoma and drug hypersensitivity syndrome (Drug Rash with Eosinophilia and Systemic Symptoms: DRESS). Semin Cutan Med Surg. 1996 Dec. 15(4):250-7. [Medline]. Callot V, Roujeau JC, Bagot M, Wechsler J, Chosidow O, Souteyrand P, et al. Drug-induced pseudolymphoma and hypersensitivity syndrome. Two different clinical entities. Arch Dermatol. 1996 Nov. 132(11):1315-21. [Medline]. Maubec E, Pinquier L, Viguier M, et al. Vaccination-induced cutaneous pseudolymphoma. J Am Acad Dermatol. 2005 Apr. 52(4):623-9. [Medline]. Magro CM, Crowson AN, Kovatich AJ, Burns F. Drug-induced reversible lymphoid dyscrasia: a clonal lymphomatoid dermatitis of memory and activated T cells. Hum Pathol. 2003 Feb. 34(2):119-29. [Medline]. Magro CM, Crowson AN. Drug-induced immune dysregulation as a cause of atypical cutaneous lymphoid infiltrates: a hypothesis. Hum Pathol. 1996 Feb. 27(2):125-32. [Medline]. Cerroni L, Kerl H. Diagnostic immunohistology: cutaneous lymphomas and pseudolymphomas. Semin Cutan Med Surg. 1999 Mar. 18(1):64-70. [Medline]. Kazandjieva J, Tsankov N. Tattoos: dermatological complications. Clin Dermatol. 2007 Jul-Aug. 25(4):375-82. [Medline]. Porto DA, Comfere NI, Myers LM, Abbott JJ. Pseudolymphomatous reaction to varicella zoster virus vaccination: role of viral in situ hybridization. J Cutan Pathol. 2009 Nov 4. [Medline]. Michaels B, Michaels J, Mobini N. Prominent lymphoid infiltrate with a pseudolymphoma-like morphology: a new histological finding of injectable liquid silicone. J Cutan Pathol. 2009 Nov. 36(11):1224-6. [Medline]. Camilot D, Arnez ZM, Luzar B, Pizem J, Zgavec B, Falconieri G. Cutaneous pseudolymphoma following tattoo application: report of two new cases of a potential lymphoma mimicker. Int J Surg Pathol. 2012 Jun. 20(3):311-5. [Medline]. Altamura D, Calonje E, Liau Jl, Rogers M, Verdolini R. Diffuse cutaneous pseudolymphoma due to therapy with medicinal leeches. JAMA Dermatol. 2014 Jul. 150(7):783-4. [Medline]. Bouloc A, Delfau-Larue MH, Lenormand B, Meunier F, Wechsler J, Thomine E, et al. Polymerase chain reaction analysis of immunoglobulin gene rearrangement in cutaneous lymphoid hyperplasias. French Study Group for Cutaneous Lymphomas. Arch Dermatol. 1999 Feb. 135(2):168-72. [Medline]. Baldassano MF, Bailey EM, Ferry JA, Harris NL, Duncan LM. Cutaneous lymphoid hyperplasia and cutaneous marginal zone lymphoma: comparison of morphologic and immunophenotypic features. Am J Surg Pathol. 1999 Jan. 23(1):88-96. [Medline]. Kitagawa KH, Grassi M. Zoledronic acid-induced cutaneous B-cell pseudolymphoma. J Am Acad Dermatol. 2011 Dec. 65(6):1238-40. [Medline]. Addeo R, Montella L, Baldi A, Cennamo G, Guarrasi R, Faiola V, et al. Atypical cutaneous lymphoid hyperplasia induced by chemotherapy in a patient with advanced colon carcinoma. Clin Colorectal Cancer. 2007 Nov. 6(10):728-30. [Medline]. Welsh JP, Ko C, Hsu WT. Lymphomatoid drug reaction secondary to methylphenidate hydrochloride. Cutis. 2008 Jan. 81(1):61-4. [Medline]. Carvalhana S, Gonçalves A, Velosa J. Cutaneous Pseudolymphoma in a Patient With Crohn's Disease Under Infliximab: First Report. J Clin Gastroenterol. 2016 May-Jun. 50 (5):436-7. [Medline]. Imafuku S, Ito K, Nakayama J. Cutaneous pseudolymphoma induced by adalimumab and reproduced by infliximab in a patient with arthropathic psoriasis. Br J Dermatol. 2012 Mar. 166 (3):675-8. [Medline]. Guis S, Schiano de Colella JM, Bonnet N, Andrac-Meyer L, Balandraud N, Mattei JP, et al. Cutaneous pseudolymphoma associated with a TNF-alpha inhibitor treatment: etanercept. Eur J Dermatol. 2008 Jul-Aug. 18 (4):474-6. [Medline]. Braun RP, French LE, Feldmann R, Chavaz P, Saurat JH. Cutaneous pseudolymphoma, lymphomatoid contact dermatitis type, as an unusual cause of symmetrical upper eyelid nodules. Br J Dermatol. 2000 Aug. 143(2):411-4. [Medline]. Goyal A, Moore JB, Gimbel D, Carter JB, Kroshinsky D, Ferry JA, et al. PD-1, S-100 and CD1a expression in pseudolymphomatous folliculitis, primary cutaneous marginal zone B-cell lymphoma (MALT lymphoma) and cutaneous lymphoid hyperplasia. J Cutan Pathol. 2015 Jan. 42 (1):6-15. [Medline]. Bachelez H. The clinical use of molecular analysis of clonality in cutaneous lymphocytic infiltrates. Arch Dermatol. 1999 Feb. 135(2):200-2. [Medline]. Thurber SE, Zhang B, Kim YH, Schrijver I, Zehnder J, Kohler S. T-cell clonality analysis in biopsy specimens from two different skin sites shows high specificity in the diagnosis of patients with suggested mycosis fungoides. J Am Acad Dermatol. 2007 Nov. 57 (5):782-90. [Medline]. Morales AV, Arber DA, Seo K, Kohler S, Kim YH, Sundram UN. Evaluation of B-cell clonality using the BIOMED-2 PCR method effectively distinguishes cutaneous B-cell lymphoma from benign lymphoid infiltrates. Am J Dermatopathol. 2008 Oct. 30 (5):425-30. [Medline]. Dayrit JF, Wang WL, Goh SG, Ramdial PK, Lazar AJ, Calonje E. T-cell-rich angiomatoid polypoid pseudolymphoma of the skin: a clinicopathologic study of 17 cases and a proposed nomenclature. J Cutan Pathol. 2011 Jun. 38 (6):475-82. [Medline]. El-Dars LD, Statham BN, Blackford S, Williams N. Lymphocytoma cutis treated with topical tacrolimus. Clin Exp Dermatol. 2005 May. 30(3):305-7. [Medline]. Baumgartner-Nielsen J, Lorentzen H. Imiquimod 5%: a successful treatment for pseudolymphoma. Acta Derm Venereol. 2014 Jul. 94(4):469. [Medline]. Singletary HL, Selim MA, Olsen E. Subcutaneous interferon alfa for the treatment of cutaneous pseudolymphoma. Arch Dermatol. 2012 May. 148(5):572-4. [Medline]. Tomar S, Stoll HL, Grassi MA, Cheney R. Treatment of cutaneous pseudolymphoma with interferon alfa-2b. J Am Acad Dermatol. 2009 Jan. 60(1):172-4. [Medline]. Mikasa K, Watanabe D, Kondo C, Tamada Y, Matsumoto Y. Topical 5-aminolevulinic acid-based photodynamic therapy for the treatment of a patient with cutaneous pseudolymphoma. J Am Acad Dermatol. 2005 Nov. 53(5):911-2. [Medline]. Erickson SP, Nahmias Z, Rosman IS, Sternhell-Blackwell K, Musiek AC. Sustained remission of recalcitrant cutaneous lymphoid hyperplasia after thalidomide treatment. JAAD Case Rep. 2018 Apr. 4 (3):245-247. [Medline]. Lucinda TS, Hazel OH, Joyce LS, Hon CS. Successful Treatment of Tattoo-Induced Pseudolymphoma with Sequential Ablative Fractional Resurfacing Followed by Q-Switched Nd: YAG 532 nm Laser. J Cutan Aesthet Surg. 2013 Oct. 6(4):226-8. [Medline]. [Full Text]. Biopsy specimens of pseudolymphoma vary substantially, but they most often exhibit a mixed inflammatory infiltrate with prominent lymphoid follicle formation. A mixed inflammatory infiltrate with germinal centers is indicative of lymphocytoma cutis. Well-developed lymphoid follicles in a background of mixed inflammatory cells with small lymphocytes are typical of lymphocytoma cutis.